Well it is that time again for Miss Sky’s drama class to start back up. So that means our Fridays will be a bit busier. This will be her last year in creative drama before she moves on to beginning acting. Once she completes one beginning acting class she is “officially” ready to start auditioning for plays. She is really excited about this. Miss Sky does not have a shy bone in her body. She most defiantly does not take after me. Yesterday was all about dairy. 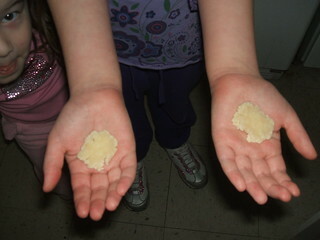 I decided to throw in a little science to the mix and for starters we made curds and whey. 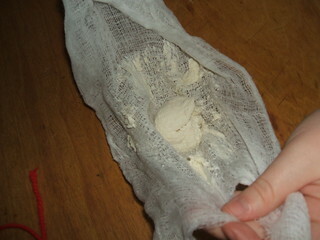 This also just so happens to be how to make casein, the very first plastic. You can find the recipe and project information here . 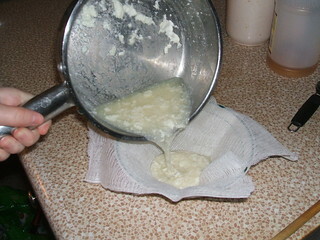 Once the whey has all been drained you are left with the curds which make a rather tasty cheese. 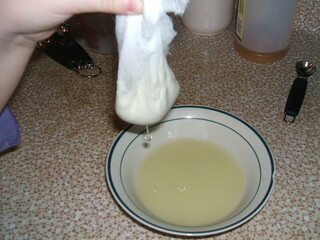 You then can take and mold the cheese into a shape to let harden overnight and it becomes casein. They used casein to make buttons. This was fun, I enjoyed learning about plastic and wonder why no one has thought of a way to use this natural product more. We plan on making more of this cheese again. Miss Sky has found another favorite recipe she can make on her own. She has expanded from last years recipe ,besides this one happens to be gluten-free (and low in sodium dad 🙂 ). 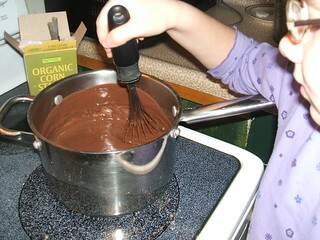 Homemade chocolate pudding (I will spare you pictures of them licking the pan). 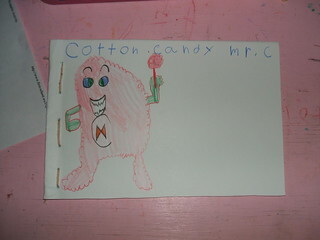 Little Sis has been adding to her book. 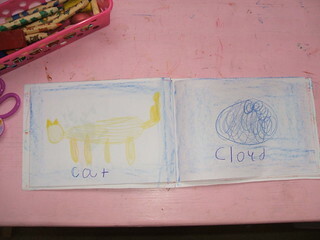 And Miss Sky finished copying her poem. Today since Miss Sky had drama and this week was about the letter C, we decided to watch our favorite version of Cinderella with a very young Julie Andrews. First though it was a reading of our favorite version of Cinderella by Charles Perrault. We are planning to take a little detour next week and continue with the letter C, because C also stands for cross stitch,chicken scratch , cards, and California. Well this morning Miss Sky woke up with a 24 hour stomach virus. I got busy right away making chicken broth (natures antibiotics) for chicken noodle soup and pushing the probiotics. After getting her all situated comfy on the couch I knew the words that soon would be spoken next, “Mom do I have to do school today?”. Hmm well that is a rather tricky question. So I give her the answer she is expecting to hear “of course not”. Now as mothers we are all well aware there are many different levels of sick. I knew after a temperature reading of 99.1 ,amongst other things that come along with a stomach virus, that indeed Miss Sky was sick but I have also come to know that if a child is able to ask if we “have” to do school then they aren’t “that” sick if you catch my drift. So as far as completing a “typical” school day, no we didn’t have school today. Instead we all snuggled up on the couch and I read the story of Rachel Carson Friend of the Earth by Francene Sabin. I knew this would peak Miss Sky’s interest, especially the part how after she wrote the book Silent Spring ,about chemical pesticides and their effect on the world around us, they pegged her as a “kook and a hysterical woman”. Well this was all it took for Miss Sky to start telling me how everything down to the smallest ant has a its own part to play in our world. How when we start hearing about the bee population decreasing we better start wondering why. This was a very special moment for me as a parent. I have managed to instill the love of our planet into my child and she is now ready to take over stewardship. Since we read the biography of a marine biologist I thought today would be a good day to watch our favorite documentary about the ocean Blue Planet. 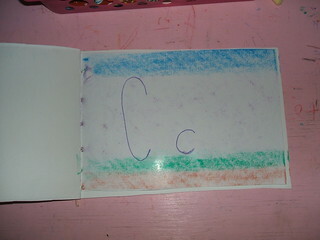 As for Little Sis I read her a book from her book basket and she has been practicing the letter C and adding pictures to her book. 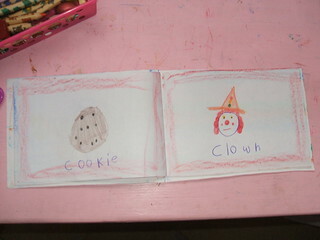 Yesterday Miss Sky practiced her spelling words and worked on her vocabulary words. 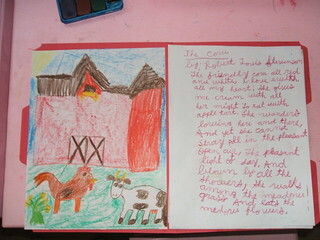 She drew her picture and is copying the poem The Cow by Robert Louis Stevenson in her book. I have to say that even though today wasn’t exactly what I had planned I am pretty happy with the outcome. Oh and you bet I am going to let Miss Sky keep on believing she didn’t do school today :). Our State Of The Union Address. And boy it was a good one too ;). I will say I am very much enjoying my research on the animals we are studying. I thought I would list resources that have made my study a little easier. I am using the Handbook of Nature Study by Anna Botsford Comstock for most of our study (for myself). This book will take us through botany, earth science, and astronomy not to mention our study of animals. For this weeks lesson on C we are studying cattle. Cattle is something we are very familiar with as each week we pick our milk and eggs up at a farm. They have Jersey cattle. My hope is not to offend vegetarians but we believe and support beef farmers who treat their cattle humanely. We have become friends with both our dairy and beef farmers and know how they treat their animals. Our beef farmer was a dairy farmer and raises Holstein cattle. We enjoy our visits to the farms and the Little’s have been able to get up close and personal to both these breeds. While learning about the origin of cattle I came across some interesting facts like how up until 1850’s everyone had a cow and the first cow to come to North America was in 1611 at Jamestown. This website helped quite a bit in this weeks research especially the bottom links. After breakfast out the Little’s went to play in the snow, the temperature finally reached above 20. Then back inside for Miss Sky to work on her math. This weeks circle includes the same winter songs as the last 2 weeks with 2 new songs that start with the letter C.
Next it was into the schoolroom for our main lesson. 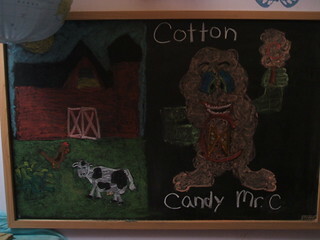 Little Sis started a new book about C and practiced writing it on her chalkboard. Next I told Miss Sky about my new knowledge of cattle. I told her how a cow is female and a bull is male. I also explained the difference in an ox and steer. We learned cattle were not native to North America but are related to the bison family because of the way they eat and digest food. We also talked about how useful cattle were. This conversation lead us to milk, hormones and the treatment dairy cows. This is something that has effected our family and Miss Sky is aware of what is happening to the dairy industry. Today the Little’s read independently (well Little Sis looked anyhow) from the library basket in place of our read aloud time. Wishing everyone a happy Monday ! Okay, I am sorry if I have been sounding a bit redundant but I am really happy with the way our days have been flowing. School is wrapping up much earlier than before, I even find myself wondering if I have forgotten something. These last 2 weeks have been great. Everyone is happy. I have to say I wondered how Little Sis would do with the pace we are moving. This is a child that you introduce a topic and she is like okay got it, time to move on. I am thinking the 3-day rhythm might not work for her. Anyway, she is loving it, the pace is perfect. She is given just enough each day to make her feel like she has accomplished something. For a child that tends to stay in her head quite a bit, introducing the alphabet has actually worked to balance her more. I thought she would push me to do more but she hasn’t. But if that wasn’t enough she no longer is interested in wanting to do workbooks while Miss Sky is. She will ask me “mommy do I have to do my workbooks ?” and of course I say no then she goes and plays on her own. This is HUGE. I know this may sound odd but she never really liked to play. She uses to pile animals up so she could be tall enough to reach the bookshelf and could entertain herself for hours (seriously) coloring. Her favorite thing to do with toys was to place them all in a straight line in the middle of the floor, that’s it. People would ask me what to get her as gifts and I would say lots of paper and a box of crayons. Could it possibly be now that she is getting her “mind” filled, her body wants to play? I don’t know but I like it. Now that we are finishing earlier Miss Sky has time to follow her own interests. 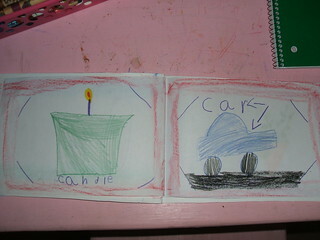 I was completely amazed at “Christmas school” how much she learned on her own. It has always been my goal to keep our bottom bookshelf full of “resource” books, I happen to find at the thrift stores 50% off sales, for whenever inspiration should strike. Well, to make a long story short I um stopped. Well not anymore, Miss Sky has taken an interest in the colonial times and been doing a little studying on her own. 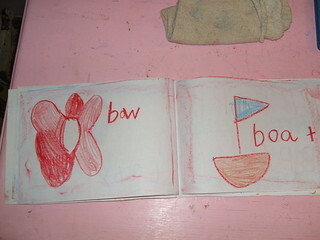 Today wrapped up our study of B and Little Sis finished her book. We practiced Miss Sky’s spelling words yesterday and since she got 100 there was no need to take the test today. In fact, if I notice she isn’t having trouble with any of her words we may just drop the “test” altogether. She is grasping how to break down words quite well and learning how to look words up on her own in the dictionary. 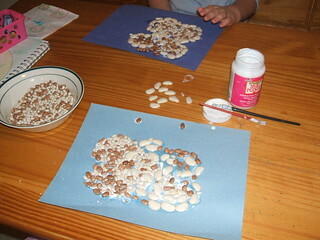 We finished the week up with an art project using beans while we listened to Jack and the Beanstalk. For today’s baking project we made bagels. I think out of all the things I missed the most when gluten-free was homemade bagels. Once you have homemade you can never eat store-bought again. I took this opportunity to review fractions again. While these rested we finished our book Bowser the hound. Wishing everyone a warm weekend! 4th grade in a Waldorf school is when the children finally venture out from stories about nature and begin to learn more about the world around them from an anthroposophy point of view. In order to prepare for this block I read The Human Being and the Animal World by Roy Wilkinson. I read this and let it sink in then reread it again. I love a quote found on page 2 of this booklet “they” (talking about the teachers) “must subscribe to, or at least be in sympathy with the ideas on evolution propounded by Dr. Steiner (Otherwise , of course , they should not be in the school)”. The last part is my favorite. This booklet goes on to describe Steiner’s ideas of evolution. If one has never taken the time to know what Steiner’s view on evolution is I REALLY recommend reading this book. I will say it is actually rather clever his “theory” and to be honest it is one that really will never be proven or denied. Like all theories on creationism and evolution it all comes down to ones own opinion and faith. We are still using a three-day rhythm because I think using sleep as an aid really works. I also believe in letting Miss Sky retell the facts without any prodding from me. If she forgets something it must not be that important to her. 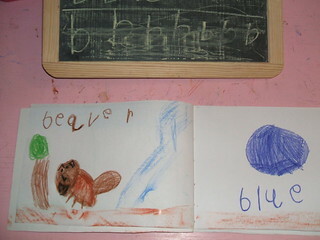 Yesterday she told me everything she has learned about beavers so far and she made a picture. We are doing something different ,since this is such a long block, I am going to bind her work after our study instead of working out of a MLB. Today she come up with a composition. First we talked about what should go into a report and she made a list of facts she wanted to include. Then I wrote her dictation on the board for her to copy. I printed off a map of the world to include in her book and she is keeping track of where the animals we study are from by writing them on the map. I am thinking this will help her with memorizing the continents. She also looked up this weeks vocabulary words in the dictionary. 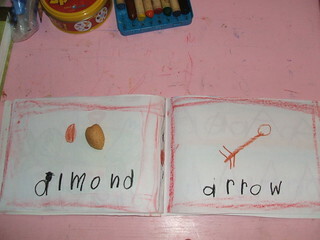 She practiced her spelling words yesterday looking at them then turning her paper over and trying to spell them. Today she practiced them while walking forward one step for each letter,then stepping backward while spelling them backwards. We are on chapter 29 of Bowser The Hound. 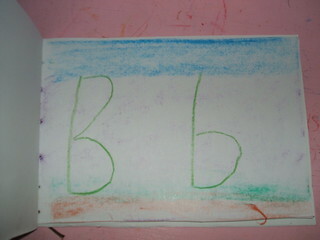 For Little Sis Miss Sky read a book from her book basket then she practiced writing the letter B on her chalkboard. Up until now she has been copying words off the chalkboard and is in the habit of writing the bump part of the B from earth to heaven. She is already understanding heaven to earth and been working to correct the habit. We have been naming different things that start with B and of course for Little Sis the only thing of importance right now is The Beatles. 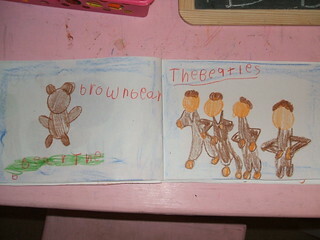 I love her drawing of them. Today I read The Tale of Benjamin Bunny by Beatrix Potter. Miss Sky has been reading the Felicity American Girl series she received for Christmas from my dad and step-mom. She is really enjoying them. This of course has sparked new handwork projects and continued work on her “sampler”. It is so cool because our neighbors got the girls colonial paper dolls for Christmas. I am thinking the girls would love these for the dress up box. I love when learning takes on its own adventure. I decided , since the Little’s love Thornton W. Burgess so much, it would be a good idea to incorporate more conservationists into our animal block. Miss Sky has an amazing memory when it comes to animals. Big Sis jokes about the time she took her to our children’s museum and she was telling the lady that worked there all about the ocean. My sister and I joke how she is going to be the next (female) Steve Irwin. Miss Sky loves documentaries about animals her favorites being Blue Planet,Planet Earth, and now Life (thanks to Big Sis). We will be using Life With Mammals during our block. We also will be reading stories from both Burgess and Beatrix Potter during this block as well as biographies about Rachel Carson, Eugenie Clark, and Jane Goodall. Many people don’t know that besides being a very talented writer and artist Miss Potter was also a conservationist and farmer buying land to ensure its preservation. When she died she left over 4, 000 acres and 15 farms to the nation. You can find a Burgess coloring book on-line for free here . 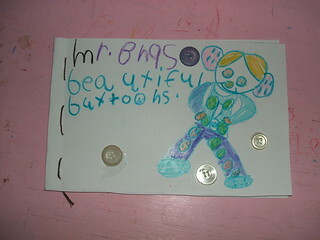 Today was all about Mr. B and his beautiful buttons. 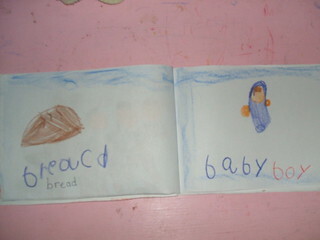 First we started our day with workbooks while I prepared our dinner for the day. Miss Sky is working out of a new Kumon fraction workbook for math. I have also mentioned how she enjoys doing Word Ladders . 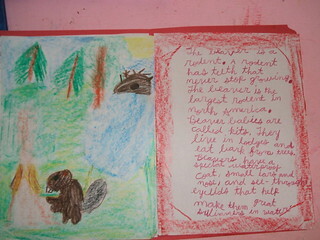 I am always writing funny stories about Little Sis well today I have one about Miss Sky. She was working on her Word Ladder workbook yesterday and she came to the last step on the ladder, the previous word to use as the clue was pond. Her hint for the last word was “A baby horse, change one letter”. She says mom I can’t get the last one, it can’t be colt, foal, or filly. I said no think of a horse that starts with p. She just looks at me, and I say pony. OMGoodness she started to go off. “MOM A PONY IS NOT A BABY HORSE, IT IS A SMALL HORSE.” “A pony will not grow bigger it is as big as it is going to get.” One quick look on-line proved my daughter’s case. We are thinking about writing the company to let them know the clue should read A Small Horse instead of A Baby Horse. This weeks book basket includes Little Sis’s most favorite stories, the Frances series by Russell Hoban. 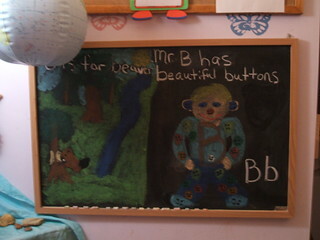 I introduced Mr B and his beautiful buttons to Little Sis and she practiced writing the letter on her chalkboard. Then we read a book about the rodent beaver. If that wasn’t enough B’s for one day. Papa and Miss Sky played battleship while I fixed Beef and Broccoli for dinner. 🙂 We are on chapter 20 in our read aloud. Bowser The Hound by Thornton W. Burgess. Wishing everyone a great week ! My planning wheels are once again turning. Inspiration once again is striking. Happiness once again has found its way into our household. After half a year of struggling to get through lessons we have finally found “our” groove. I do not regret the process that brought me here, it was needed to help get me to this next level. Though homeschooling is nothing new it is to those of us that graduated from a “traditional” school. We know that it is the right decision for our family but with all the many different ways to do it, it can become very overwhelming and confusing. As parents we just want what is best for our children. So we research and research , some of us lose sleep (me), some of us get so overwhelmed we end up doing nothing, and some of us just give up. They think if it’s this hard I will never be able to do it. Truth is we don’t have to do anything for our children to learn, it just comes “naturally”. Just like our children learn to walk and talk they will learn to read and write, the difference is in the child itself not the method. Following the methods of Charlotte Mason, Rudolf Steiner, Maria Montessori, Susan Wise Bauer, and John Holt will all bring the same results, a well-educated child. There is SO much we can learn from those that paved the way and studied child education ,such as the names listed above,(here comes the big but :)) BUT that was what was right for THEM , at the time, for those children. We however live in a different time period. Steiner worried about “beautiful dolls”, I worry whether my children will be able to live without the use of some technical device. I can’t stop progress but I can teach moderation. I see so many parents new to homeschooling filled with guilt and worry(I know this from first hand experience). I spent MANY long hours and nights reading, listening to lectures wanting to make sure I was doing it right, it wasn’t until I “let go” and started to listen and watch MY children that I realized they will not fit into any one of these methods, each one of my girls are different. Being able to homeschool to their needs to me ,in my most humble opinion, is what “freedom in education” truly means. This year as part of my new “beginnings” I plan on reading less about the “correct” way to homeschool. Instead I plan on spending more time learning “how” to homeschool from my children. Wishing everyone many blessings for the start of the week. Okay while planning this year out I was very hesitant when it came to this years math blocks. I remember back during my school years not liking fractions very much. Add that to a daughter who generally dislikes math and you can see the reason behind my concern. Imagine my surprise when after finishing the book Apple Fractions Miss Sky looks over at me and says “That’s it ?” Could she really have grasped it that quick? 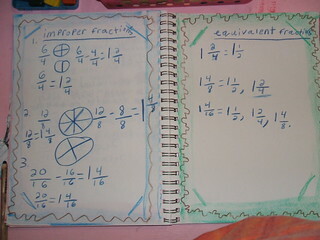 Well we have continued working with improper and equivalent fractions this week and indeed my daughter gets it. She has even been making her own worksheets practicing adding and subtracting them without any persuasion from me. If that wasn’t enough for this Mama to be singing joyous praises she has even figured out that everything can be a fraction and been going around reciting problems off all day. “Today is Thursday we are 4/7 of the way through the week. You cut that carrot into 8 pieces Little Sis and I each ate one, 2/8 of the carrot is gone or we ate 1/4 of the carrot.” Today’s baking project provided the same results “There are 4 sticks of butter , we are using 1/4 of the butter.” Okay who are you and what have you done with my daughter? Today wrapped up our letter A study. 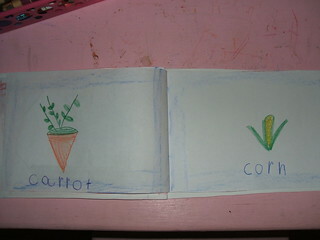 Little Sis finished her book. Just in case there are any readers who might not be familiar with this method, I am teaching Little Sis that capital letters must touch heaven and earth where some lower case letters only touch the earth. We also start in heaven and come down to earth. The Little’s unanimously agreed that today’s baking project should be cookies instead of pie. There seems to be a split vote in our household when it comes to pie and today with my better half gone I lost. So cookies it was. After being 4 months gluten-free ( You must be gluten-free at least 3 months to see a difference) Little Sis started to develop allergies. At first I thought it was typical autumn allergies but as the temperatures began to drop her allergies didn’t ease up. Since Papa is the only one sensitive to gluten I started to add a little gluten back at a time and her allergies went away. So as my new motto for the year states, everything in moderation, we have just cut down on our intake of wheat. We have however cut the gluten out of other products that in my opinion shouldn’t contain gluten in the first place like ketchup. We are using Annie’s Naturals (I must have ketchup to make my BBQ sauce , after all I am originally from Kansas City, Missouri). Something else I want to start doing this year is to document more of the everyday moments of family life. Sometimes blogs can be very deceiving. Parenthood is hard just as it is rewarding, bitter-sweet. I know someday I will look back and really miss moments like these. You blink and they are gone. 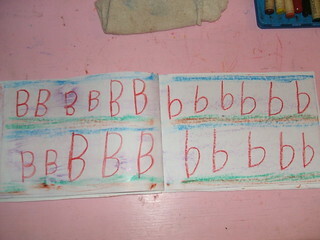 Next week we move on to the letter B, and our animal study. 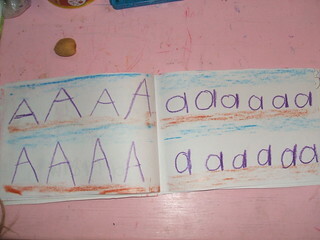 I think I am really going to enjoy learning the alphabet :). Wishing everyone a great weekend ! There is a great book I feel everyone should read Called Everything I Want To Do Is Illegal by Joel Salatin. It is about a small farmer that found out very quickly just exactly how much freedom we don’t have in this country. Below is a letter I received today from our milk farmer. Organic Valley no longer wants small farms to sell milk to customers on the side. Our family will no longer support Organic Valley. Their company says they are “farmer” owned and have all the best interest in helping small farms. However I believe if this were true they wouldn’t have a problem with farmers selling milk on the side. I mean after all it is their cows. It never fails to amaze me how this could happen when at one time the majority of people in our country raised and produced most of their own food. Where we live use to be a dairy farm, now we are not even allowed to have chickens. There is a little game Papa and I like to play when we travel called subsidized or not. You can always tell whether a farmer is subsidized by the house they live in. I educate my children to know that we all do have a voice in this world and here in this little space I have decided to share mine. We want to share some information with you . As of January 1st, Organic Valley (our milk co-op) has determined that they will not allow any of their farmers to sell raw milk. We know that nearly all of the dairy farmers are selling some raw milk. By the way, the co-op is receiving a lot of flack about this decision, so it may be overturned at some point in the future. A representative from Organic Valley visited our farm in December and said that we will be kicked out of Organic Valley if we continue to sell raw milk, although we can sell a small amount to close friends. We told them that we consider all of our customers our friends. Please read this entire email. We cannot afford to not sell our milk to Organic Valley as there are no other organic routes in our area. It really boils down to the fact they would rather go to the larger dairies and pick up a larger quantity of milk. We are one of the 2 remaining dairies in xxxxxxxxx, and there is only one dairy in xxxxxx County. We told Organic Valley yesterday to give us a couple of weeks for us to let our milk customers that we will not be able to provide raw milk to them.